I am absolutely obsessed with this parfait I created the other day! The picture does not do it justice! I promise it is phenomenal!!! Plus, in my opinion Peanut Butter + Apples= A matched made in heaven! Place quinoa, ½ cup almond milk, vanilla and cinnamon in a pot on the stove. Place on medium heat until it comes to a boil. Turn to low and cover until no liquid is left. Then add in ⅛ cup almond milk and stir for a couple of minutes. Take off heat and chill in the fridge. Mix greek yogurt and peanut flour until it is mixed through. 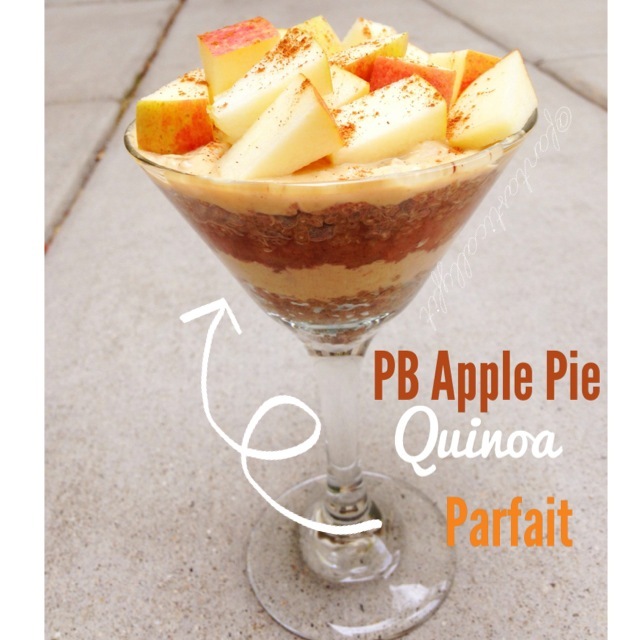 0 Responses to "Peanut Butter Apple Pie Quinoa Parfait"
Going to try this tomorrow. Cannot believe I hadn’t found you sooner!! Will be buying the rebook at the end of the week!! Could i replace peanut flour with almond butter?